Energy efficient home heating solutions. Designed for reliability, efficiency and performance. Temperature control, relay, and ignition functions in a single module. For residential and small commercial applications with approved chimney. Controls located inside the jacket and easily accessible from the front of boiler. The Aruba 4 Series (AWR) residential, cast iron, hot water boiler is a fully-packaged, installer-ready product. The rear draft diverter provides a low profile design that allows for closet applications on AWR models through the AWR210. This atmospheric, gas-fired boiler is for use with a conventional chimney fueled with natural or LP gas. The Aruba 4 features a standardized Honeywell Intermittent Ignition System. The Aruba 4 comes with an Integrated Boiler Control with temperature control, relay, and ignition functions in a single module. This includes an additional circulator output for a second heating zone or an indirect water heater like the Mega-Stor. All controls are located inside the front vestibule, creating a clean look and space efficient design. With the controls located in the front of the boiler and supply/return tappings on both the left and right side, the Aruba 4 has flexible installation options to fit most locations. Designed with through-the-wall venting for homes without chimneys or where the chimney cannot be used. Temperature control, relay, and ignition functions in a single module. Includes additional circulator output for a second heating zone or an indirect water heater. The Bali Series (BWF) residential, cast iron, hot water boiler is a fully-packaged, installer-ready product. An integral fan permits venting directly through a wall. With the addition of a Category-1 Vent Kit, the Bali has the option of venting into some chimneys that are too small to vent an atmospheric boiler of the same input. The Bali Series is packaged with an electronic ignition system and has the option of either natural or LP gas. Meet the Phantom®! 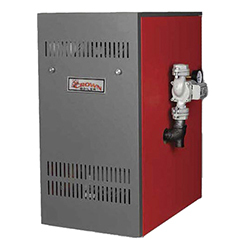 This wall-mounted condensing boiler has a stainless steel water tube heat exchanger, and is one of our most efficient offering. The Phantom is available in five sizes (80, 100, 120, 150, and 180 MBH) with multiple venting options. 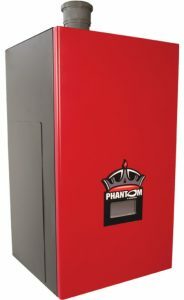 The Phantom offers “Smart Boiler” capabilities, like outdoor reset and a modulating burner with 5:1 turndown ratio. A Honeywell SOLA control with a touchscreen user interface comes standard, as does low water cutoff, and side panel access to the circulator makes this boiler a serviceman’s dream. Watch the video below to learn more about the Phantom® stainless steel condensing boiler! The stainless steel, gas-fired Raptor is our first fire tube design for natural or LP gas offering superior efficiency and performance with a 95% AFUE. 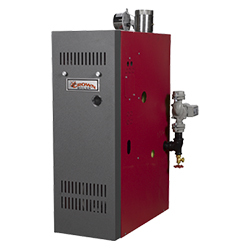 The boiler is available in five sizes – 85, 110, 155, 205, and 270 MBH. A 155-MBH combi model is also available featuring a thermostatic mixing valve and brazed plate heat exchanger. 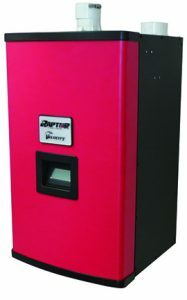 The Raptor and Raptor Combi offer home heating and optional domestic hot water built on world-class engineering. All Raptors include a user-friendly touch screen interface, 5-to-1 turndown ratio and an outdoor reset function to ensure top performance in response to demand and outdoor temperature changes.